APRIL BISON CHUCK SALE! Buy $150, all Buffalo items marked "CHUCK" are ON SALE @ 20% OFF until 11:59 PM April 30, 2019. Use Promo Code "BUFFCK" when directed. APRIL GOAT SALE! Buy $100 and all GOAT items are ON SALE @ 20% OFF until 11:59 PM April 30, 2019. Use Promo Code "GOAT419" when directed. APRIL ELK RUMP SALE! Buy $125 and all Elk Rump items marked "RUMP" are ON SALE @ 10% OFF until 11:59 PM April 30, 2019. Use Promo Code "ELK10" when directed. NO "free shipping" markups at Grande Meats...JUST WAY CHEAPER PRICES! SHOP & COMPARE As some companies offer, IS "FREE SHIPPING" REALLY FREE? THE BEST GAME MEAT PRICES on the NET! Even AFTER the shipping cost! "Hi I just wanted to say thank you for your time and effort regarding my order. It's great. I will remember that you guys are the best" A.K, Brooklyn, NY. Want More Testimonials - Click here. Great values on Game meats, elk venison, deer venison, buffalo, goat meat, rabbit meat, Wild Boar all at America's BEST Elk & Deer Retailer! You have found America's Value leader in Elk meat (Venison), Buffalo meat, Goat Meat, Wild Boar meat and Deer meat or Whitetail Venison. We sell only the highest-quality USDA-FDA Elk meat, Whitetail Meat, rabbit meat, wild boar, Jerky, Elk Steaks, Buffalo Steaks Elk jerky and delicious venison products to restaurants, retail stores and the public via our ranch-based elk and buffalo meat store, and now via the internet...nationwide! We also have Deer meat like Whitetail Venison, Fallow deer or Sika Venison. Try our various Buffalo & Elk meat (Venison), Wild Boar or Bison meat products, frozen meats, sausage, bratwurst or our famous bison jerky, elk Jerky or buffalo jerky.... and we are sure you'll agree, feasting on GRANDE NATURAL Elk Meat, Buffalo Meat, Rabbit Meat, Goat Meat, Wild boar and Venison is a great way to eat heart-healthy. We now even have Smoked Salmon and Smoke Trout for a health conscience treat! So limit your fats and cholesterol with either elk or buffalo or even Deer, but still get a great, no-gamey taste! Check out all our new Elk Meat and Whitetail Venison, Give us a try. Our mission is to become America's Natural Meat source where everyday consumers can find all natural Elk or Buffalo products and now All-Natural Chevon (goat meat) and Deer Venison (Whitetail, Fallow and Reds) at prices you can afford. We replenish our stocks of natural meats at regular intervals insuring a recently flash frozen, delicious product every time. 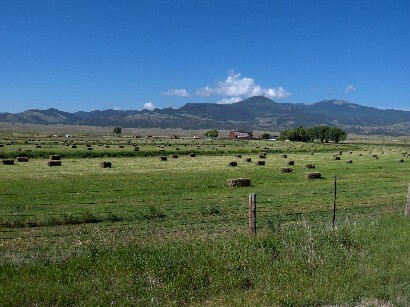 All our elk, deer and buffalo is derived from grass-fed animals with never a hint of steroids or animal by-products. Remember, elk meat is a form of Venison (deer meat) so the lean and flavorful nature of Venison comes through with our elk meat, but not will any hint of a gamey taste. Since we are one of the largest discount elk meat distributors in the USA our elk prices are more than competitive, and will be some of the best you can find. Our discount Buffalo Meats are predominately grass-fed and grain-finished to produce a tender, juicy and flavor buffalo steaks, easily some the best buffalo you can buy. Our prices for buffalo meat are exceptional, we dare you to find them much cheaper. Lastly, our Goat meat, Wild Boar Meat and deer Venison is number ONE in quality but lower in price than everybody else, just shop and compare. We can always beat the competition with a better quality product and a vastly superior price. Look over our Natural Meat selection and you will be impressed. We will endeavor to bring American venison from all around the USA. Besides our delicious Elk Meat, we have all-American Red Deer, Mid-Western USA Fallow Deer and America's long-time favorite, Northern Whitetail deer venison. Our small deer venison selection is always State or USDA or FDAinspected, flash frozen and deer-licious. Venison burger, venison roasts, venison steaks and venison jerky round out our deer meat collection. Try our deer meat venison, and you will be a repeat customer. So look around our site, try a few products and we will become your source for all-natural red meats at really fair prices. Elk, buffalo, small deer Venison and Goat at affordable prices, that is what we do best! Our expanding line of Goat meats are worth a try. Can 75% of the rest of the world be wrong. Young goat meat is quite good, and suprisingly, so is Wild boar meat. Not that bland pork so common in today's markets. Wild Boar meat is lean, full flavored and delicious. Lastly, don't forget about our Dog products: like Elk Dog's Breakfast, Buffalo Dog's Dinner, Goat Dogs Lunch, A Dog's Deer Buffet, dog jerky, dog chews and our original famous Antler chews made from elk and deer antler. The best, most long lasting dog chew treats you can find for your pet! Your dogs will love this stuff! 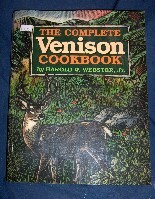 For one of the best Whitetail Venison or Elk cookbooks in the country (recipes work for low fat buffalo cuts as well) try the Complete Venison Cookbook by Harold Webster. 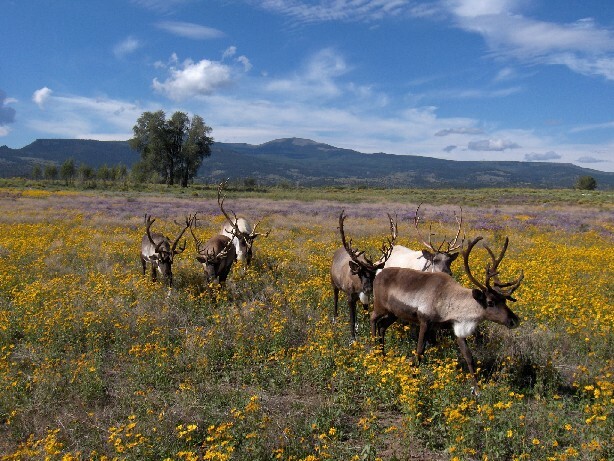 We are a featured elk and Whitetail venison supplier! Home | Site Map | Useful Links | Contact Us | (Back to Top) | Shipping FAQs | Looking for Moose meat?